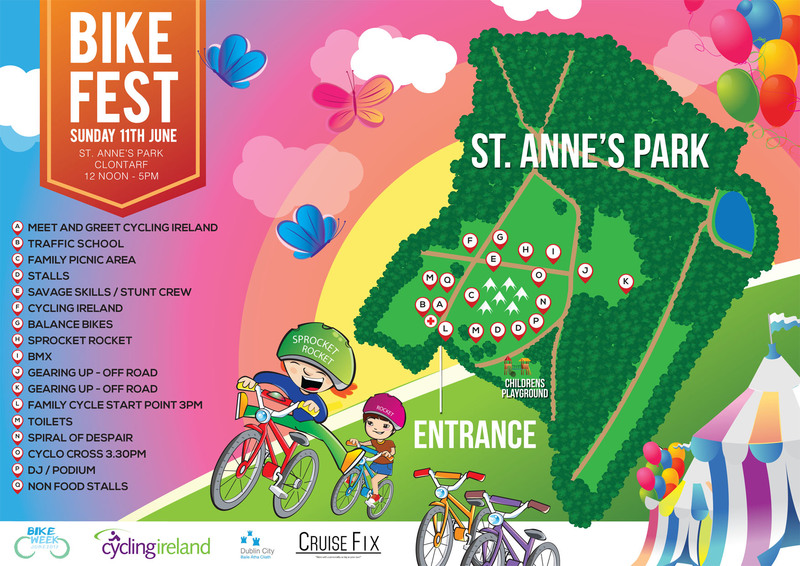 News in brief: The larger-scale Bike Week events in Dublin City kick off at Bike Fest in St Anne’s Park on the northside this Sunday, June 11, from 12 noon to 5pm. The event is organised by Cycling Ireland, CruiseFix and Dublin City Council. National Bike Week runs from June 10 to 18, see bikeweek.ie for details of events around Ireland. PLEASE NOTE: This article is corrected with the addition of ” The larger-scale” to the start of the first sentence. As noted above, please see bikeweek.ie for a full list of events. Thanks Colm — for accuracy I’ve corrected the start of the article by adding in “The larger-scale”. @Dublinstreams – you can cycle anywhere in the park. There’s no ‘no-cycling’. Just have a look on Google maps and any of the routes you see there, you can cycle. Sorry, forgot to add – there are no designated places to lock your bike at all. Perhaps there might be some new stands around the coffee place at the Red Stables (? there didn’t used to be, but I haven’t been in that cafe for over a year) but there’s nothing anywhere else. In St Annes people usually lock their Bikes to Trees, or the Railings around Trees. At the Red Stables they lock their Bikes to the Railings but this gets full quickly. Sometimes they use the Crowd Control Rails for Locking Bikes to if they are available.Sometimes these are provided for Bike Parking. I suggest people should bring a Chain as it is handy to lock around Trees. Sometimes a group of friends lock their Bicycles together. You should try and use two Locks for locking your Bike and try to secure both Wheels. I was on Parnell St at ALDI one day and when I came out. I noticed one Chap talking to his Girlfriend with his Bike in his Hand minus the front Wheel. I asked him if it was stolen and he said yes. He said they stole my front Wheel. Then they went off presumably to get help. So secure your front and rear Wheel as well as your Bicycle. I was there a few weeks back had to lock my bike to fence at the back of the carpark, just pointing out the irony of bicycle festival in park with bicycle parking. Technically it is true, that cycling is banned in most city parks, but the City Council in their DRAFT Parks Strategy are looking to get more bike access to Parks in the City as policy, in order to promote greater active travel. And, as anyone cycling in St Anne’s Park knows, it is a common pastime there. LOADS of people cycle, skate, skateboard through the park. I cycle through it every single day. Never once have park staff even looked at me funny. Ok, yea, maybe they do look at me funny, but that’s just because I look a bit funny. Nothing to do with the bike. Me and everyone else, so. Thousands of people every week. As I say, I come across park workers all the time and they’re not concerned at all. There’s even a stunt-ramp section in the park that guys on BMXs use all the time. Local BMXers made it. It’s been there years and is a great amenity.